Superyacht concepts come in all shapes and sizes, from evolutionary designs that subtly push the envelope to much more radical ideas that boldly challenge the orthodoxy. We round up some of the most out-there ideas from around the world... Designed by Kurt Stand, Strand Craft’s California is an extremely spacious yacht, stretching to 135 metres. Its ultra-modern exterior sports large panes of glass, and the three swimming pools on the yacht’s aft decks create the effect of a cascading waterfall. True to its name, one of California’s pools even includes a surf riding machine. With so much room, it’s unsurprising that its interiors are filled with a number of exceptional features. Alongside carrying 24 guests and 50 crew, California includes a bowling alley, a 24-seat cinema and a classic car showroom for the owner’s collection. Koi ponds, waterfalls and colourful aquariums add a sense of "zen" to the interior passages of the yacht – but there’s also a nightclub on board. Despite its size and luxury amenities, California boasts an environmentally-friendly design; it runs on power provided by a 60-tonne lithium-ion battery bank and all tenders and toys on board would also be electrically powered. Designed by Kurt Stand, Strand Craft’s California is an extremely spacious yacht, stretching to 135 metres. Its ultra-modern exterior sports large panes of glass, and the three swimming pools on the yacht’s aft decks create the effect of a cascading waterfall. True to its name, one of California’s pools even includes a surf riding machine. With so much room, it’s unsurprising that its interiors are filled with a number of exceptional features. Alongside carrying 24 guests and 50 crew, California includes a bowling alley, a 24-seat cinema and a classic car showroom for the owner’s collection. Koi ponds, waterfalls and colourful aquariums add a sense of "zen" to the interior passages of the yacht – but there’s also a nightclub on board. Despite its size and luxury amenities, California boasts an environmentally-friendly design; it runs on power provided by a 60-tonne lithium-ion battery bank and all tenders and toys on board would also be electrically powered. 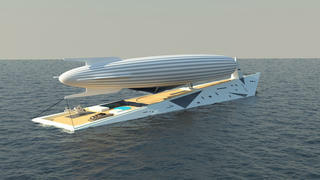 Like its curious name, Roberto Curtó’s 63.2 metre Hypnosquid also has a unique design. When planning the yacht's exterior with SuperYachtsMonaco, Curtó was inspired by the shape of a cuttlefish and the creature’s ‘elegant, fast and agile’ nature under water. One key exterior design feature is the line of LED coloured windows, which represent the cuttlefish's eyes and punctuate the main deck. 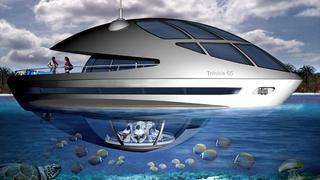 Hypnosquid, which has room for 10 guests and 12 crew, also includes an onboard garden, massage centre and cinema room. Special touches include the Jacuzzi’s waterfall feature and the dining area, where guests can watch the chef at work in the galley during their meal. Like its curious name, Roberto Curtó’s 63.2 metre Hypnosquid also has a unique design. When planning the yacht's exterior with SuperYachtsMonaco, Curtó was inspired by the shape of a cuttlefish and the creature’s ‘elegant, fast and agile’ nature under water. One key exterior design feature is the line of LED coloured windows, which represent the cuttlefish's eyes and punctuate the main deck. 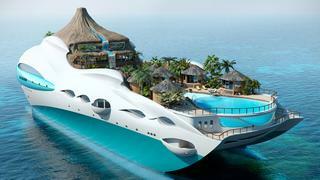 Hypnosquid, which has room for 10 guests and 12 crew, also includes an onboard garden, massage centre and cinema room. Special touches include the Jacuzzi’s waterfall feature and the dining area, where guests can watch the chef at work in the galley during their meal. The largest design yet from husband and wife team Demetrius and Dana Tanase (aka Expleo Design), 110 metre Elyon has a simple yet ambitious motto: "Aim for the highest". This approach is reflected in the concept's multitude of on-board features, with both indoor and outdoor swimming pools, a spa, gym and wellness area, and even a casino room. The striking exterior was inspired by calm waves and features a dramatically sloped reverse bow. Accommodation is for up to 30 guests and the hull has been designed to achieve a top speed of 18 knots. The largest design yet from husband and wife team Demetrius and Dana Tanase (aka Expleo Design), 110 metre Elyon has a simple yet ambitious motto: "Aim for the highest". This approach is reflected in the concept's multitude of on-board features, with both indoor and outdoor swimming pools, a spa, gym and wellness area, and even a casino room. The striking exterior was inspired by calm waves and features a dramatically sloped reverse bow. Accommodation is for up to 30 guests and the hull has been designed to achieve a top speed of 18 knots. 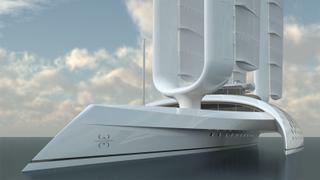 French naval architect Mathis Rühl has released a new 70 metre trimaran superyacht concept called Wind Motion. As with his previous R77 sailing yacht concept, the key innovation lies in the rig, which features a multiple rotating twin wingmast fitted with foldable sails. Fully automated, this system would provide the yacht’s main propulsion even in medium wind conditions. Unlike the R77, Wind Motion features a central pivot point that supports two spars, reducing weight and vibrations, increasing the aerodynamic efficiency and freeing up more deck space. What’s more, Rühl explains that the rig could be fitted with wind turbines that would charge the yacht’s batteries when resting at anchor. Functionality aside, Wind Motion boasts a striking aesthetic with a reverse-angled wave-piercing prow and a curved superstructure inlaid with glass panels. Al fresco relaxation options are plentiful with space for sunloungers on both the foredeck and the aft deck, while the superyacht sundeck features a central skylounge surrounded by teak. Further details are being kept under wraps for now with no word on the internal layout, engine installation or total guest capacity. 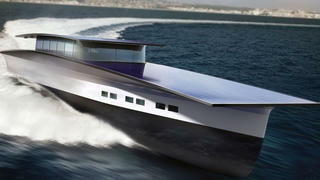 French naval architect Mathis Rühl has released a new 70 metre trimaran superyacht concept called Wind Motion. As with his previous R77 sailing yacht concept, the key innovation lies in the rig, which features a multiple rotating twin wingmast fitted with foldable sails. Fully automated, this system would provide the yacht’s main propulsion even in medium wind conditions. Unlike the R77, Wind Motion features a central pivot point that supports two spars, reducing weight and vibrations, increasing the aerodynamic efficiency and freeing up more deck space. What’s more, Rühl explains that the rig could be fitted with wind turbines that would charge the yacht’s batteries when resting at anchor. Functionality aside, Wind Motion boasts a striking aesthetic with a reverse-angled wave-piercing prow and a curved superstructure inlaid with glass panels. Al fresco relaxation options are plentiful with space for sunloungers on both the foredeck and the aft deck, while the superyacht sundeck features a central skylounge surrounded by teak. Further details are being kept under wraps for now with no word on the internal layout, engine installation or total guest capacity. Inspired by 17th century pirate ships, 58 metre Caronte is the latest bold concept from the boards of Italian studio Lazzarini Design. The imposing bulwarks tower six metres above the waterline, allowing for huge interior volume, with room for two luxury cars to be stored in the aft garage. Moving up to the main deck, the dining area includes a rectangular table with room for ten guests to enjoy a meal together. 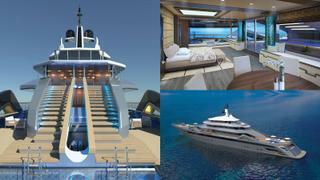 Other key features include an upper deck helipad, a 4.5 metre spa pool and a superyacht gym concealed in the forepeak. The feasibility of such a concept is up for debate, but for anyone who wants to get in touch with their inner pirate, this divisive yacht design takes some beating. Inspired by 17th century pirate ships, 58 metre Caronte is the latest bold concept from the boards of Italian studio Lazzarini Design. The imposing bulwarks tower six metres above the waterline, allowing for huge interior volume, with room for two luxury cars to be stored in the aft garage. Moving up to the main deck, the dining area includes a rectangular table with room for ten guests to enjoy a meal together. 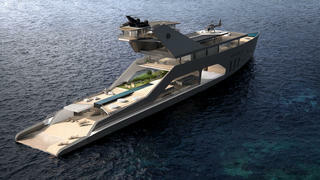 Other key features include an upper deck helipad, a 4.5 metre spa pool and a superyacht gym concealed in the forepeak. The feasibility of such a concept is up for debate, but for anyone who wants to get in touch with their inner pirate, this divisive yacht design takes some beating. Traditional Asian sailing vessels, as well as the namesake paper folding art, inspired this 100 metre concept from Monaco-based artist George Lucian, who admits that it is “at the limit of modern technology and innovation”. 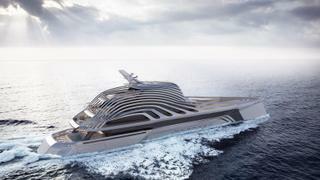 Origami elements include a portside section that folds out to create a touch-and-go superyacht helipad as well as a glass-sided observation lounge. Moving further forward and the mast rises from the centre of the full-beam swimming pool and culminates in a crow’s nest for the ultimate in 360-degree views out to sea. 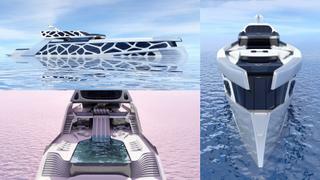 Expleo Design's debut concept, the 100 metre Intimisea places a strong emphasis on wide-open spaces. This can be seen in the sprawling aft deck with its huge swimming pool, which can be accessed directly from the upper deck via four slides. 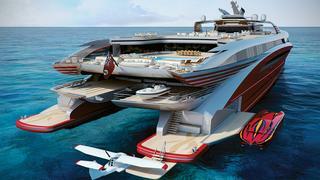 Other standout features include a foredeck helipad, owner’s deck, gym, 45-person cinema and even an on-board casino. Accommodation is for 12 guests and 25 crewmembers, while the hull has been designed around a cruising speed of 16 knots. 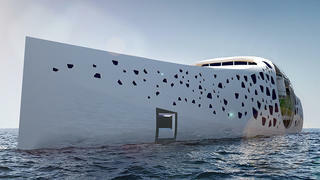 Expleo Design's debut concept, the 100 metre Intimisea places a strong emphasis on wide-open spaces. This can be seen in the sprawling aft deck with its huge swimming pool, which can be accessed directly from the upper deck via four slides. 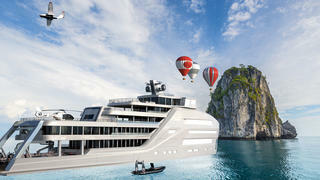 Other standout features include a foredeck helipad, owner’s deck, gym, 45-person cinema and even an on-board casino. Accommodation is for 12 guests and 25 crewmembers, while the hull has been designed around a cruising speed of 16 knots. 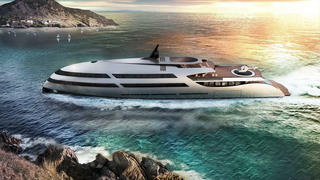 Erupting with fresh ideas, Mauna Kea is the new 101 metre superyacht concept from Italian designer Roberto Curtó. Named after a dormant Hawaiian volcano, this clever design features two large staircases that gently slope down from the upper deck to the main deck, much like the flow of lava from a recently erupted peak. The aft staircase sports a fun feature — a central water slide that allows guests to splash down in the pool below, which is surrounded by seven sunpads. Although this design is still at the concept stage, it has already caught the eye of brokerage firm SuperYachtsMonaco and potential build partner Fincantieri Yachts. What’s more, Italian naval architecture studio Navirex helped to develop the steel hull, which is designed around a top speed of 16.5 knots and a maximum cruising range of 6,000 nautical miles at 12 knots. 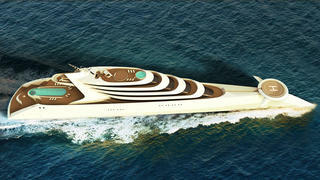 Erupting with fresh ideas, Mauna Kea is the new 101 metre superyacht concept from Italian designer Roberto Curtó. Named after a dormant Hawaiian volcano, this clever design features two large staircases that gently slope down from the upper deck to the main deck, much like the flow of lava from a recently erupted peak. The aft staircase sports a fun feature — a central water slide that allows guests to splash down in the pool below, which is surrounded by seven sunpads. Although this design is still at the concept stage, it has already caught the eye of brokerage firm SuperYachtsMonaco and potential build partner Fincantieri Yachts. What’s more, Italian naval architecture studio Navirex helped to develop the steel hull, which is designed around a top speed of 16.5 knots and a maximum cruising range of 6,000 nautical miles at 12 knots. Inspired by Middle Eastern culture and modern architecture, the 87 metre neWWave shatters convention with its flowing aluminium superstructure. Designer Jaehoon Ahn penned this radical exterior, which creates interesting shadows, both on deck and in the internal spaces, which benefit from 3.6 metres of headroom for a total volume of 3,600GT. The visual blurring of the decks is carried through to the layout, with a dedicated prayer room, which would benefit from eight metres of headroom, spanning the lower two decks, and a multi-level owner's suite that makes use of the top two decks. Other key features include four large aft decks with a ten metre aft deck swimming pool, fire pit, al fresco dining area and spa pool. The propulsion system is undisclosed at this stage, but neWWave's Palmer Johnson-inspired hull has been designed to achieve a top speed of 16 knots. Inspired by Middle Eastern culture and modern architecture, the 87 metre neWWave shatters convention with its flowing aluminium superstructure. Designer Jaehoon Ahn penned this radical exterior, which creates interesting shadows, both on deck and in the internal spaces, which benefit from 3.6 metres of headroom for a total volume of 3,600GT. The visual blurring of the decks is carried through to the layout, with a dedicated prayer room, which would benefit from eight metres of headroom, spanning the lower two decks, and a multi-level owner's suite that makes use of the top two decks. Other key features include four large aft decks with a ten metre aft deck swimming pool, fire pit, al fresco dining area and spa pool. The propulsion system is undisclosed at this stage, but neWWave's Palmer Johnson-inspired hull has been designed to achieve a top speed of 16 knots. Created by Ricky Smith as a statement of progressive superyacht design, Era is an 80 metre concept that immediately catches the eye with its dramatic reverse bow, stacked foredeck superstructure and flowing, organic lines. Stuart Friezer Marine Naval Architects developed the underwater profile, which has been tank tested at Shanghai University, suggesting a top speed of 25 knots would be possible. Accommodation is for 20 guests and 24 crew, and key features include a superyacht beach club, a main deck swimming pool, and a side-loading tender garage. Meanwhile, the upper deck superyacht helipad makes full use of Era’s 13 metre beam, meaning a Bell 427 or a Eurocopter EC145 could be carried with ease. Created by Ricky Smith as a statement of progressive superyacht design, Era is an 80 metre concept that immediately catches the eye with its dramatic reverse bow, stacked foredeck superstructure and flowing, organic lines. Stuart Friezer Marine Naval Architects developed the underwater profile, which has been tank tested at Shanghai University, suggesting a top speed of 25 knots would be possible. Accommodation is for 20 guests and 24 crew, and key features include a superyacht beach club, a main deck swimming pool, and a side-loading tender garage. Meanwhile, the upper deck superyacht helipad makes full use of Era’s 13 metre beam, meaning a Bell 427 or a Eurocopter EC145 could be carried with ease. Designed to take on the world, the 90 metre explorer yacht concept Taboo was developed by Gill Schmid Design and Tim Dempers Studio. Both polar and tropical destinations are well within the long-range capabilities of this ice-classed design. Taboo is capable of carrying a whole host of smaller vessels that would allow her owner to explore the most remote corners of the planet, including a plane, helicopter, submarine and amphibious car, not forgetting a bevy of luxury tenders. The monochromatic exterior styling features extensive use of one-way glass; giving panoramic views from the owner and VIP suites without compromising on privacy. Accommodation is for 26 guests and 40 crew, but the star of the show is a superyacht swimming pool flanked by aquaria so your guests can literally swim with the fishes. Designed to take on the world, the 90 metre explorer yacht concept Taboo was developed by Gill Schmid Design and Tim Dempers Studio. Both polar and tropical destinations are well within the long-range capabilities of this ice-classed design. Taboo is capable of carrying a whole host of smaller vessels that would allow her owner to explore the most remote corners of the planet, including a plane, helicopter, submarine and amphibious car, not forgetting a bevy of luxury tenders. The monochromatic exterior styling features extensive use of one-way glass; giving panoramic views from the owner and VIP suites without compromising on privacy. Accommodation is for 26 guests and 40 crew, but the star of the show is a superyacht swimming pool flanked by aquaria so your guests can literally swim with the fishes. Inspired by a growing trend towards informal luxury living, Project Ego is a new 36 metre superyacht concept from Italian designer Mauro Giamboi, who knows a thing or two about multihull superyachts after designing the award-winning 33 metre Quaranta. Project Ego makes good use of an enormous 12.8 metre beam with a layout that includes a vast saloon and two guest cabins on the main-deck. But the star of the show is the transformable transom, which allows guests to relax in close proximity with the sea. Inspired by a growing trend towards informal luxury living, Project Ego is a new 36 metre superyacht concept from Italian designer Mauro Giamboi, who knows a thing or two about multihull superyachts after designing the award-winning 33 metre Quaranta. Project Ego makes good use of an enormous 12.8 metre beam with a layout that includes a vast saloon and two guest cabins on the main-deck. But the star of the show is the transformable transom, which allows guests to relax in close proximity with the sea. This 140 metre airship carrier is every bit as ambitious as its name would suggest. Another George Lucian design, Dare To Dream targets visionary superyacht owners who are equally passionate about aviation as they are about yachting. The enormous aft deck dominates this avante-garde design, with a helipad and circular swimming pool. Guest accommodation is provided on the lower deck, as well as a saloon for enjoying anything from an evening cocktail to a formal meal. British studio Duffy London created this 44 metre concept, which features a fast-planing hull and six 2,600hp engines that would run off a combination of solar power and alcohol to produce a sporty top speed of 45 knots. Accommodation on board is for 10 guests and seven crew, and to prove that this concept is feasible Duffy London has even stuck a price tag on it — Solaris can be yours for a cool £25 million (ex. VAT). Montreal-based designer Charles Bombardier is the brains behind this wild superyacht concept, which aims to mimic the movement of a whale. Its two submerged pods would create waves to drive the yacht forward, while the trailing aft section adds to the stability of the design. 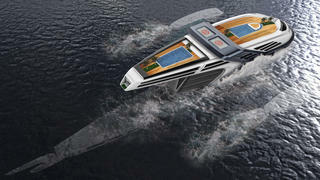 Bombardier worked with industrial designer Martin Rico to create Seataci, which also features a pair of superyacht swimming pools and a tropical garden. Measuring 190 metres LOA, L’Amage is a super-size concept that dwarfs even 180 metre Azzam, which is currently the world’s largest yacht. 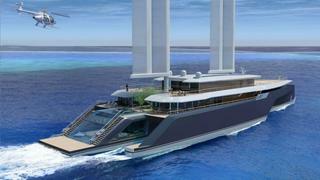 Designed by HBD Studios, this mammoth yacht would feature accommodation for 30 guests split across 15 cabins, while the crew quarters would house a staff of 70. 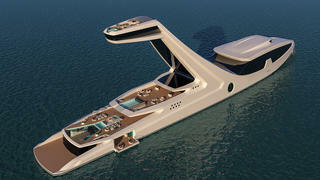 Hamid Bekradi, design director at HBD Studios, told Boat International: “The general style of the interior is modern and minimalist, in harmony with the exterior styling of the yacht.” L’Amage’s superyacht helipad is situated right up on the prow and is flanked by two wings that contain cutting-edge flat satellite panels from Kymeta and navigation lights. Back aft, the beach club features an outdoor fire pit and an extending transom with three sliding piers. Power would come from an MTU CODAG propulsion system for a top speed of 32 knots and a maximum cruising range of 6,000 nautical miles. L’Amage’s superyacht helipad is situated right up on the prow and is flanked by two wings that contain cutting-edge flat satellite panels from Kymeta and navigation lights. Back aft, the beach club features an outdoor fire pit and an extending transom with three sliding piers. Power would come from an MTU CODAG propulsion system for a top speed of 32 knots and a maximum cruising range of 6,000 nautical miles. Dutch yard Feadship caused a stir at this year's Monaco Yacht Show with its latest superyacht concept, Project Choice. Measuring 74.5 metres, this fuel-efficient design will burn 29% less fuel than an equivalent 80 metre superyacht, Feadship claims. Key features include a two-person passenger drone and a pair of integral tenders that provide primary propulsion and charge the central battery bank. When detached, the mothership can cruise silently at ten knots on battery power alone. Other cutting-edge tech on board includes a motion-compensation pool that uses magnetic levitation to resist any rolling motion. The result is a perfectly still superyacht spa pool with no splashing or waves. 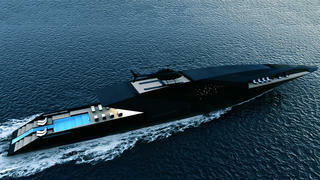 Dutch yard Feadship caused a stir at this year's Monaco Yacht Show with its latest superyacht concept, Project Choice. Measuring 74.5 metres, this fuel-efficient design will burn 29% less fuel than an equivalent 80 metre superyacht, Feadship claims. Key features include a two-person passenger drone and a pair of integral tenders that provide primary propulsion and charge the central battery bank. When detached, the mothership can cruise silently at ten knots on battery power alone. Other cutting-edge tech on board includes a motion-compensation pool that uses magnetic levitation to resist any rolling motion. The result is a perfectly still superyacht spa pool with no splashing or waves. Designed by Italian studio BFMV, Bolla is a 65 metre superyacht concept that won bronze in the yacht and marine vessels category at the 2015 A’Design Awards. The designers’ aim to connect the air and the water inspired both the striking spherical bubble in the centre of the symmetrical superstructure and the name (which means ‘bubble’ in Italian). Bolla would feature a dive centre and an on-board vegetable garden to further enhance the yacht’s close affinity with nature. 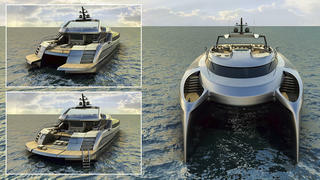 BFMV also has plans for a custom superyacht tender that would closely mirror the design of the mothership. Designed by Italian studio BFMV, Bolla is a 65 metre superyacht concept that won bronze in the yacht and marine vessels category at the 2015 A’Design Awards. The designers’ aim to connect the air and the water inspired both the striking spherical bubble in the centre of the symmetrical superstructure and the name (which means ‘bubble’ in Italian). Bolla would feature a dive centre and an on-board vegetable garden to further enhance the yacht’s close affinity with nature. 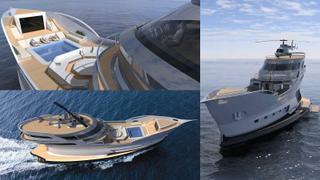 BFMV also has plans for a custom superyacht tender that would closely mirror the design of the mothership. With its 108 metre concept, Norwegian studio Hareide Design has sought to shift the emphasis from admiring the interiors to enjoying the surroundings. As a result, this wild superyacht concept includes a seamless transition to the water with the gently sloping transom, as well as a multifunctional grand hall that provides uninterrupted views. With its 108 metre concept, Norwegian studio Hareide Design has sought to shift the emphasis from admiring the interiors to enjoying the surroundings. As a result, this wild superyacht concept includes a seamless transition to the water with the gently sloping transom, as well as a multifunctional grand hall that provides uninterrupted views. Turkish designer Timur Bozca is the brains behind this sinister-looking superyacht concept, which shuns convention and embraces dark tones through its minimalist interior. At 70 metres LOA, Black Swan is designed around its helipad, from which guests can descend into the interior via a concealed lift. Plenty of al fresco relaxation space is provided by the extended aft deck, complete with 12 sunloungers and an infinity pool, while two forward balconies provide unobstructed views out to sea. Triangular hull windows help to illuminate the interior, which includes accommodation for up to 12, split across a master suite and six guest cabins. Based in the Turkish coastal town of Kas, Timur Bozca leapt to prominence last year by winning the Young Designer of the Year Award at the ShowBoats Design Awards 2015. His entry, Project Cauta, was a 55 metre ketch design. Turkish designer Timur Bozca is the brains behind this sinister-looking superyacht concept, which shuns convention and embraces dark tones through its minimalist interior. At 70 metres LOA, Black Swan is designed around its helipad, from which guests can descend into the interior via a concealed lift. Plenty of al fresco relaxation space is provided by the extended aft deck, complete with 12 sunloungers and an infinity pool, while two forward balconies provide unobstructed views out to sea. Triangular hull windows help to illuminate the interior, which includes accommodation for up to 12, split across a master suite and six guest cabins. Based in the Turkish coastal town of Kas, Timur Bozca leapt to prominence last year by winning the Young Designer of the Year Award at the ShowBoats Design Awards 2015. His entry, Project Cauta, was a 55 metre ketch design. Inspired by the growing trend for spectacular superyacht pools, Shaddai is a 150 metre concept by Gabriele Teruzzi that gives the owner the best view in the house. The dramatic superstructure includes a master suite and 105 square metre beach club suspended 38 metres above the main aft deck. And with such a commanding position, it’s easy to see why the concept has been named after the Hebrew word for omnipotence. Inspired by the growing trend for spectacular superyacht pools, Shaddai is a 150 metre concept by Gabriele Teruzzi that gives the owner the best view in the house. The dramatic superstructure includes a master suite and 105 square metre beach club suspended 38 metres above the main aft deck. And with such a commanding position, it’s easy to see why the concept has been named after the Hebrew word for omnipotence. The 'out of the box' 144 metre Ghost concept was formed by the team at Ken Freivokh Design, who followed a "deconstructionist", minimalist approach. The designers have left the structure of the yacht visible, which not only takes care of the torsional rigidity of the yacht, but also allows wide openings such as the large shell doors, which the designers said can "accommodate the likes of a 15 metre sportfish tender". There is even a light-sensitive film on the skin of the yacht, which generates enough power to take care of the hotel loads. Perfect for people who like the idea of minimalism, but still want to own a huge superyacht. The 'out of the box' 144 metre Ghost concept was formed by the team at Ken Freivokh Design, who followed a "deconstructionist", minimalist approach. The designers have left the structure of the yacht visible, which not only takes care of the torsional rigidity of the yacht, but also allows wide openings such as the large shell doors, which the designers said can "accommodate the likes of a 15 metre sportfish tender". There is even a light-sensitive film on the skin of the yacht, which generates enough power to take care of the hotel loads. Perfect for people who like the idea of minimalism, but still want to own a huge superyacht. The team at Yacht Island Design were tasked with creating an idyllic, island getaway — but on a yacht. The result is known as Tropical Island Paradise. The huge exterior main deck includes some of the features of a tropical island paradise, including a huge swimming pool, cabanas and a bar. But the standout feature is the volcano, with a waterfall that runs down into the swimming pool. The two-deck owner's suite is cut into the side of the volcano, with views out across the bow from behind the waterfall. 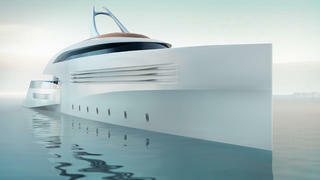 The sculpted wave form of the yacht hides a large aft deck with helicopter landing pad. Also hidden from view is the huge deployable beach deck, which folds down from the stern to create an area for sea level relaxation. Perfect for private island owners who always wished they could take their island home with them. The team at Yacht Island Design were tasked with creating an idyllic, island getaway — but on a yacht. The result is known as Tropical Island Paradise. The huge exterior main deck includes some of the features of a tropical island paradise, including a huge swimming pool, cabanas and a bar. But the standout feature is the volcano, with a waterfall that runs down into the swimming pool. The two-deck owner's suite is cut into the side of the volcano, with views out across the bow from behind the waterfall. The sculpted wave form of the yacht hides a large aft deck with helicopter landing pad. Also hidden from view is the huge deployable beach deck, which folds down from the stern to create an area for sea level relaxation. Perfect for private island owners who always wished they could take their island home with them. Is it a bird, is it a plane? 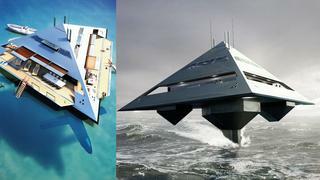 No, but the Tetrahedron superyacht does fly. If your first thought is, “That’ll never get built,” think again. Designs for Tetrahedron have been around for a while, but its designer, Jonathan Schwinge, is looking to forge a partnership to build the wild yacht design with a big German yard. At rest, or low speeds, the carbon fibre Tetra is effectively a trimaran, floating on three underbelly hulls. At speed, it rises on foils jutting out of a torpedo hull, allowing it to 'fly' at speeds of up to 38 knots. It works, too, as it’s based on an existing hull design by the Maritime Applied Physics Corporation in the US. Despite measuring just 21.6 metres, its unusual shape still guarantees lots of volume, providing accommodation for six guests and four crew. Is it a bird, is it a plane? No, but the Tetrahedron superyacht does fly. If your first thought is, “That’ll never get built,” think again. Designs for Tetrahedron have been around for a while, but its designer, Jonathan Schwinge, is looking to forge a partnership to build the wild yacht design with a big German yard. At rest, or low speeds, the carbon fibre Tetra is effectively a trimaran, floating on three underbelly hulls. At speed, it rises on foils jutting out of a torpedo hull, allowing it to 'fly' at speeds of up to 38 knots. It works, too, as it’s based on an existing hull design by the Maritime Applied Physics Corporation in the US. Despite measuring just 21.6 metres, its unusual shape still guarantees lots of volume, providing accommodation for six guests and four crew. 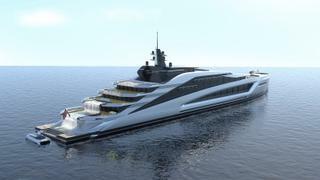 The CF8 Future is an 80 metre superyacht concept from Dutch studio Sea Level Yacht Design. CF8 stands for ‘Cars and Family in 80 metres’. Part yacht, part car showroom, the CF8 can accommodate a car collection for passers by to admire. Large centerline structures support the decks — this allows the yacht to be wrapped in a glass skin that welcomes light into the voluminous interiors. 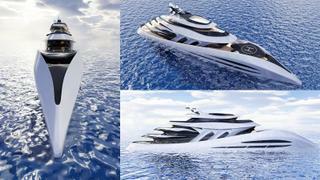 VPLP Design has come up with this 86 metre trimaran sailing yacht concept. Komorebi is a hybrid between a sailing vessel and power yacht. It is highly efficient and stable, suited just as much to crossing oceans as to anchoring in shallow bays. Komorebi has a very open design that allows light to flow into the many different areas on board. Two fully automated wing rigs make it capable of 20 knots under sail. It also has a hybrid mode that provides impressive fuel saving and a tree on the aft deck. 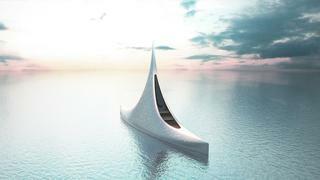 VPLP Design has come up with this 86 metre trimaran sailing yacht concept. 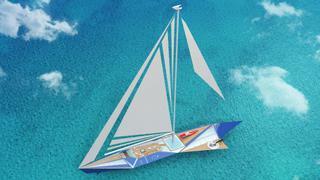 Komorebi is a hybrid between a sailing vessel and power yacht. It is highly efficient and stable, suited just as much to crossing oceans as to anchoring in shallow bays. Komorebi has a very open design that allows light to flow into the many different areas on board. Two fully automated wing rigs make it capable of 20 knots under sail. It also has a hybrid mode that provides impressive fuel saving and a tree on the aft deck. A circular 20 metre eco-yacht from Giancarlo Zema Design Group, powered by solar energy and hydrogen fuel cells, this concept is known as Trilobis 65. Six people are able to live in a fantastic, unusual environment in a self-sufficient non-polluting habitat. This futuristic vessel has an underwater observation deck with 360 degree views for six passengers and it was named after little Trilobite creatures that lived in the sea 500 million years ago. The underwater globe has computers that provide the guests with real-time information on the marine life they are looking at. A circular 20 metre eco-yacht from Giancarlo Zema Design Group, powered by solar energy and hydrogen fuel cells, this concept is known as Trilobis 65. Six people are able to live in a fantastic, unusual environment in a self-sufficient non-polluting habitat. This futuristic vessel has an underwater observation deck with 360 degree views for six passengers and it was named after little Trilobite creatures that lived in the sea 500 million years ago. The underwater globe has computers that provide the guests with real-time information on the marine life they are looking at. A yacht shaped like the top half of a star, this concept was designed by Lobanov Design and with naval architecture from BMT Nigel Gee. This aptly-named 132 metre yacht, Star, is taller than many yachts are long, measuring nearly 60 metres from the water to the top of the point. Unless you enjoy being hauled up the mast of your sailing yacht, views from the observation platform are unparalleled. Four lifts provide access across eight decks, perfect for party loving guests who can enjoy views from the top of the tip or from the underwater viewing area without running out of steam before they get there. A yacht shaped like the top half of a star, this concept was designed by Lobanov Design and with naval architecture from BMT Nigel Gee. This aptly-named 132 metre yacht, Star, is taller than many yachts are long, measuring nearly 60 metres from the water to the top of the point. Unless you enjoy being hauled up the mast of your sailing yacht, views from the observation platform are unparalleled. Four lifts provide access across eight decks, perfect for party loving guests who can enjoy views from the top of the tip or from the underwater viewing area without running out of steam before they get there. Architect Zaha Hadid is well known for jazzing things up. 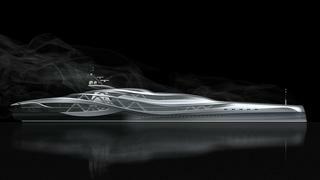 Among a family of concepts developed for Blohm+Voss is a 90 metre concept she named Jazz. Structural supports have been moved outward to open up the interior to palatial spaces. This thought-provoking design pushes the interaction between inside and outside to the extreme, and the fluid form recalls the shapes of marine creatures. This prototype is applicable in a variety of pre-engineered platforms using as much or as little of the concept’s principles as desired. The external supports free up the interior for huge, unbroken spaces, a principle that Hadid has applied in many of her building towers. 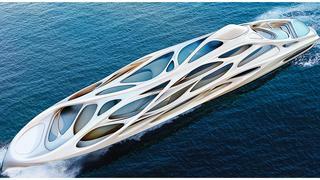 Architect Zaha Hadid is well known for jazzing things up. 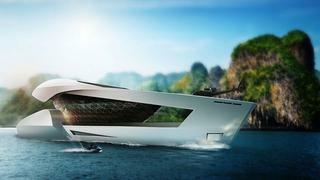 Among a family of concepts developed for Blohm+Voss is a 90 metre concept she named Jazz. Structural supports have been moved outward to open up the interior to palatial spaces. This thought-provoking design pushes the interaction between inside and outside to the extreme, and the fluid form recalls the shapes of marine creatures. This prototype is applicable in a variety of pre-engineered platforms using as much or as little of the concept’s principles as desired. The external supports free up the interior for huge, unbroken spaces, a principle that Hadid has applied in many of her building towers. A huge 85 metre residence with room for toys, L3 is a project by McPherson Yacht Design and BMT Nigel Gee based on a semi-SWATH catamaran hull. SWATHs make great platforms but they hardly look sleek. This concept manages it, and just look at the amount of on board real estate they can provide! The SWATH design allows for the kind of volume found on a 110 metre monohull and, with a hybrid CODAG propulsion, L3 can go much faster than almost any yacht this size (about 40 knots). The aft deck can be used a launch pad for toys, meaning no shadow boat is needed. Action and aviation junkies will love the speed and looks. A huge 85 metre residence with room for toys, L3 is a project by McPherson Yacht Design and BMT Nigel Gee based on a semi-SWATH catamaran hull. SWATHs make great platforms but they hardly look sleek. This concept manages it, and just look at the amount of on board real estate they can provide! The SWATH design allows for the kind of volume found on a 110 metre monohull and, with a hybrid CODAG propulsion, L3 can go much faster than almost any yacht this size (about 40 knots). The aft deck can be used a launch pad for toys, meaning no shadow boat is needed. Action and aviation junkies will love the speed and looks. 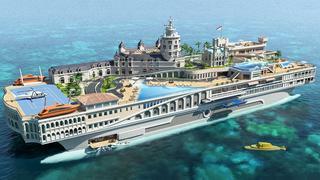 Yacht Island Design has created this** **155 metre SWATH vessel concept known as The Streets of Monaco. Naval architecture courtesy of British firm BMT Nigel Gee. The design features some of the famous landmarks from the Mediterranean principality, including the Hotel de Paris and the Casino on the upper deck. One of the most ambitious concepts yet, The Streets of Monaco has a fully functional go-kart track based on the famous grand prix circuit. Guests will be able to race like an F1 driver through the tunnel, past the swimming pool and try not to crash going round La Rascasse. The Grand Atrium acts as the central hub of the yacht, linking the various living areas. An ornate spiral superyacht staircase is the focal point, sweeping around a waterfall feature that is supplied by a glass bottomed fountain from the garden above. 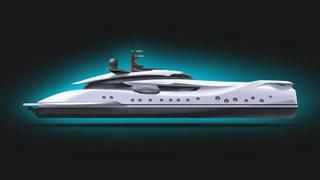 Yacht Island Design has created this** **155 metre SWATH vessel concept known as The Streets of Monaco. Naval architecture courtesy of British firm BMT Nigel Gee. The design features some of the famous landmarks from the Mediterranean principality, including the Hotel de Paris and the Casino on the upper deck. One of the most ambitious concepts yet, The Streets of Monaco has a fully functional go-kart track based on the famous grand prix circuit. Guests will be able to race like an F1 driver through the tunnel, past the swimming pool and try not to crash going round La Rascasse. The Grand Atrium acts as the central hub of the yacht, linking the various living areas. An ornate spiral superyacht staircase is the focal point, sweeping around a waterfall feature that is supplied by a glass bottomed fountain from the garden above.